Welcome to CheerHome! This is your site for all things related to cheerleading. We include cheers, latest news, shopping, and other information of interest to the cheerleading world. We are always looking for news and information of interest to the cheerleading world. If you have anything to share, please send to info@cheerhome.com. Expanded Shopping Guide – Listings, reviews, information and links for both cheer and personal shopping. Get poms, shoes, shorts, shirts and more. Only at CheerHome.com! See our latest articles on all things cheerleading! We are always looking to add more interesting content of interest for cheerleaders, parents, and coaches. Cheerleading News from around the world. Find out more and send us your cheerleading news from your school or college. Find new cheers for your team! We also accept submissions from cheerleading teams around the world. 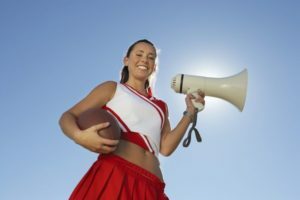 Despite the popular notion that cheerleading is not a “real” sport, everyday young men and women throughout the United States are injured in accidents that resulted from cheerleading. The sport of cheerleading involves countless hours of strenuous activity including jumping, twirling, flipping, and kicks. These activities often lead to serious injuries. We wanted to know what option an athlete has if they are injured due to someone else’s negligence. Can the injured athlete recover? If yes, for how much? We reached out to Orange County personal injury lawyer John Rapillo for his legal insight on the issue of liability after being hurt while cheerleading. Mr. Quay explained that there are several issues at play in these situations. First, was the accident caused by someone else’s negligence? In other words, did the injury occur as a result of someone breaching their duty of care? An example of this could be a coach who failed to give the proper signals or proper training. Second, was the injured athlete partially at fault? If so, some U.S. States follow the comparative fault rule. According to this rule, the injured party’s recovery will be decreased in proportion to their fault for the accident. So if the injured party is 40% at fault, then their recovery will be decreased by 40%. The last issue is whether the athlete signed a waiver. These waivers may prevent any recovery at all. If you have been injured, find out more in our latest article.